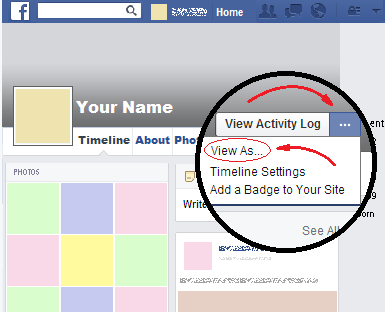 Want to view your Facebook Timeline as other people do? This guide will show you how to do it. Once you have done that, click on the points of ellipsis button ("...") that is near the lower right hand corner of your big cover picture and then, in the appearing menu, click on the “View As...” option. Once you have done that, you will be seeing your profile as the public does. If you want to see your profile as a specific Facebook friend, click on the “View as Specific Person” option located right below the search box at the top of the screen. Doing this will show, in the same place where you made the click, a text box saying “Enter a friend's name.” To select a friend you just have to start typing the person’s name there, and then click on it in the list that will appear. Once you have done that, you will be viewing your Timeline as this friend you selected does. To stop viewing your Timeline as someone else, click on the “X” near the top left hand corner of the screen. This way your Timeline view will be back to normal.